Urban street art doesn’t get much better than the colourful cobblestone laneway of Hosier Lane in Melbourne, Australia. 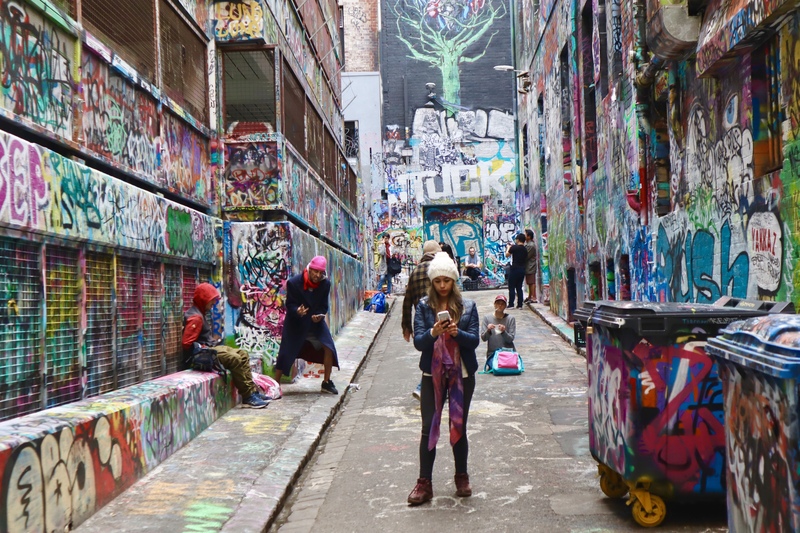 Running between Flinders Lane and Flinders Street in the CBD, the lane is visual feast of every changing street art that extends to the walls, windows, doorways, bins and stairwells of the entire laneway and the adjoining Rutledge Lane. These days the laneway is often packed with tourists posing in front of the impressive graffiti, however you can still catch a glimpse of urban grittiness courtesy of the graffiti artists and hip hop street dancers that are often in the laneway. There is one coffee shop on the street, a Culture Kings store for all things streetwear and of course the famous Movida restaurant serving up delicious Spanish tapas and wine. Flinders Lane is also home to some of Melbourne’s most famous restaurants. Want more Melbourne? Visit here to see our favourite CBD street and here for our favourite French macaron shop. Looks so vibrant!! Love it! Those Pictures are so Vibrant i love it!